Two priorities have shaped the Hans Pries Group since the company’s establishment in 1954: customer satisfaction and product quality. We are an independent family-owned firm with over 180 employees, and we now offer our customers complete service with dedicated individual contacts. 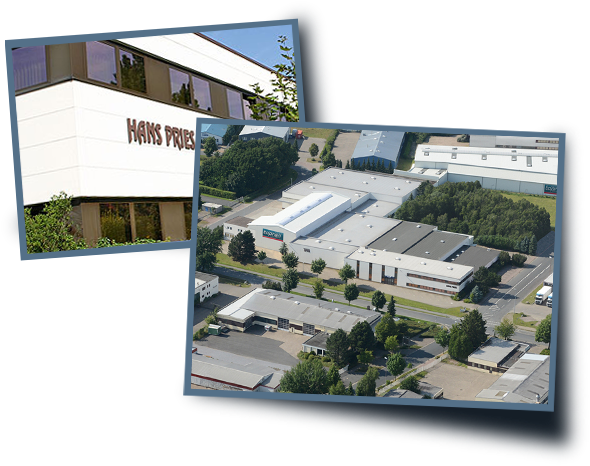 Most importantly, Hans Pries offers a broad range of products instantly available to customers. All our products, from accelerator cable to window lifter, are checked by experienced experts in thorough quality control procedures. Our advanced quality management system ensures that DIN EN ISO 9001:2015 certification is duly documented and observed. Take us for a test drive! Every day sees our longstanding customers benefit from our zeal for constant improvement. 1954: The company was founded by Lieselotte and Hans Pries on 01.10.1954. Their starting capital consisted of a used VW Beetle, a portable typewriter and plenty of ideas and energy. 1977: To survive and prosper in the spare parts business, the company decided to go into warehousing operations. The first warehouse to be built for this purpose was built in Ganderkesee, 25 km west of Bremen, in 1977. 1979: Torsten Pries also followed in the creative footsteps of his parents. After completing his degree in computer studies he took overall charge of the planning, development and expansion of software and hardware operations, thus laying the foundation for the continuous expansion of the company. The subsequent years saw the continuous expansion of warehousing capacity and the purchasing of adjacent plots to provide room for that capacity. 1997: To offer to our customers a wider selection of articles, we added a range of spare parts for OPEL to our product range in 1997. 2000: In view of the successful start made by the spare parts for OPEL, we decided to enhance our product range further by adding spare parts for FORD. We presented these for the first time in September 2000 at the Automechanika in Frankfurt. 2002: Hans Pries, an independent family firm, has developed into one of the leading export wholesalers in the spare parts sector. The former two-man show has become a respectable company with around 100 employees. 2004: Because we want to offer to our customers an increased product range we presented on the Automechanika 2004 our new spare part program for MERCEDES and BMW. This at the beginning small range is planned to grow in the next years up to the size of the range that we have already since a long time. 2005: The company Hans Pries invested again into the future and bought, according to his expansion plans, another 5,000 square meter warehouse. The company owns now 15,000 square meter high storage warehouse. Consequently our program has been extended to over 12,000 different high quality aftermarket products for VW, AUDI, SEAT, SKODA, OPEL, FORD, MERCEDES and BMW. 2008: In the last 4 years we increased the range that we already have. Now we will use the Automechanika to show to our customers our new program for French cars. From September we can offer to all our customers the spare parts for PEUGEOT and CITROËN. 2009: According to the schedule the further new warehouse with 3.000 square meter is finished. The new hall extended the complete high storage warehouse surface up to 18.000 square meter. The article range will be extended parallel and steady to this new building. 2010: Now our company offers his customers also parts for RENAULT and DACIA. 2011: Through further extension of the storage area the total area growth up to 21.000 square meter. 2012: Through a new loading terminal and the necessary no-waiting loading area the total area of the company growth up to 23.000 square meter. The new area optimize the logistic for the steady growth of the article range and order volume. 2014: Once again Hans Pries enlarges its repertoire by adding parts for the Korean brands HYUNDAI and KIA to the delivery program. Doing so the company follows the market growth development of the Korean brands and the consequential increasing demand for high quality and cost attracttive aftermarket spare parts for these brands. The new line for Korean parts will be presented to our customers for the first time during this years trade fair “Automechanika” in Frankfurt. 2015: Through further extension of the storage area the total area growth up to 25.000 square meter. 2016: One month before the AUTOMECHANIKA the company informed his customers about a strong enlargement of the article range for the brands MAZDA, MITSUBISHI, NISSAN, TOYOTA, VOLVO, ALFA ROMEO, FIAT and LANCIA. Parallel to this the Web side has been enlarged by the languages Italian, Dutch, Polish and Turkish. On the in-house DVD our customers find as well Russian and Arabian. Starting from Sep 1st, 2018 Mr. Hendrik Erdmann and Mr. Stefan Knauer are taking over responsibility as two additional General Managers. Both have gained a lot of experience and worked successfully in our company for many years. With this rejuvenation process in the executive board we continue the dynamic development of the recent years and orient the company towards the future.